After a long, involuntary hiatus from the drinking of alcohol I have again been getting my liver “wet”. I am ashamed to admit that my tolerance has gone way, way down–much too low for the amount of drinking that must needs take place in DC this fall. I dipped in gingerly a few days ago, having a Firestone Double Barrel Ale after dinner. It got me legitimately “crunk” (keep in mind here, good readers, that I AM Asian, after all… my ancestors weren’t exactly quaffing tankards of beer around some round table in the forests), but it was a delightful feeling. The Double Barrel Ale is a good beer, moderately hoppy, somewhat sweet, a rich amber color. The only down thing about the DBA was that it had an off-putting aftertaste–more like an afterfeel… a bit syrupy, but not in a pleasant way. Oh well. It was a good beer, though not one I’d put into my standard rotation. 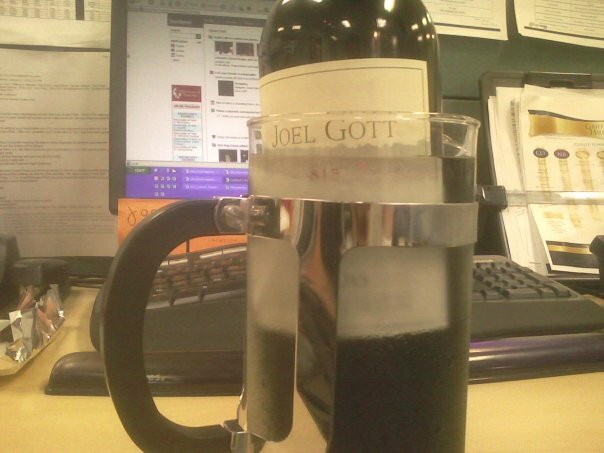 Today after work my co-workers and I opened a long-saved bottle of Joel Gott “815” cabernet sauvignon. (Named after the birth date of Gott’s daughter.) Four of us chipped in a few bucks each for the bottle back in MARCH, but there never was any real occasion or opportunity to open it up and enjoy. What better day than the day before the Fourth of July? The bottle, which had been stowed away in one of my co-worker’s cabinets for a few months, wasn’t exactly at the optimal serving temperature–a few degrees too warm, in my estimation. I decided to create a make-shift ice bucket. I was not going to just stick the bottle in the communal fridge in the other suite: people didn’t think twice about stealing half-eaten burritos; I wouldn’t take my changes with a beautiful new bottle of cab! But what could serve as the ice bucket? I thought first of a coffee pot. Unfortunately, the lip was too small and the bottle wouldn’t fit. I thought next of using a box–and plastic bag–of Kix cereal. Unfortunately, this box of cereal was far from uneaten. I could not tolerate the waste of good cereal for the sake of wine. Then, I got it: the French press with which we brewed our fancy specialty coffees! Necessity is the mother of all invention, right? This jury-rigged setup barely worked. 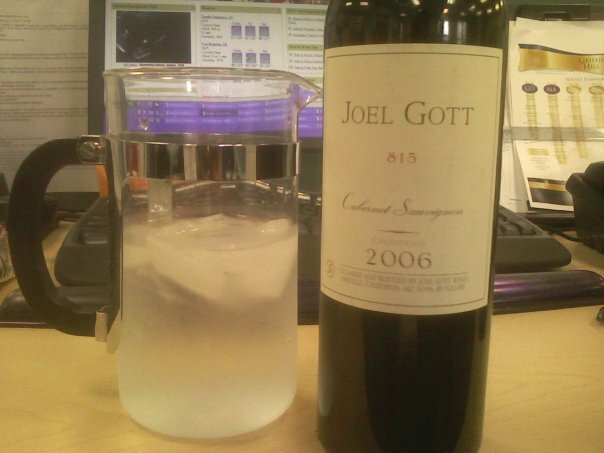 There wasn’t enough water and ice to surround the wine. This wouldn’t have worked at all for a room-temperate white that needed to be chilled; however, my goal of getting the red down a few degrees was met. I’m glad to say, also, that the holes where once my bottom teeth lived are healing nicely and no longer requiring the use of vicodin to placate. Oh alcohol, my fair beauty, my delightful maiden: I have returned! You are a lucky man to have the kind of refined palate that you do. I have yet to ever be able to taste vanilla in a red. I didn’t think it was possible! You’re description of my ancestors in the woods drinking beer (probably something similar to the hearty concoctions that I make) made me laugh.